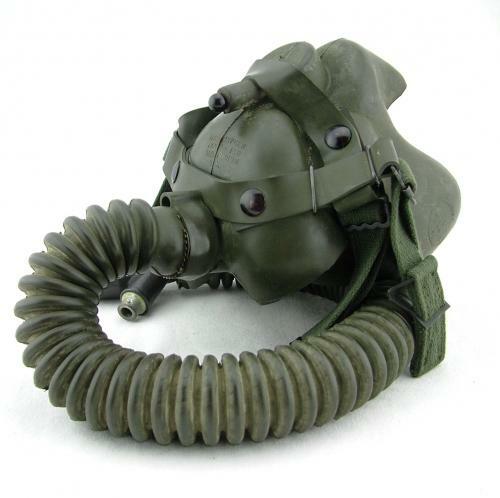 Mask, Oxygen type A-14B. Size medium c.1958. The 14B was the last modification of the A-14, first introduced during WW2. It is very similar in appearance and would make a suitable substitute for those with a tighter budget. Condition is very good. The rubber is a little grubby but completely flexible and undamaged. The rubber and webbing harness components are very good and the hose, complete with MC3A connector shows no signs of deterioration. Comes with an original USAF oxygen mask canvas container. Stock code O21147.